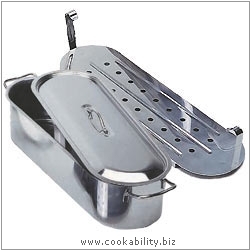 A quality 18/10 stainless steel fish poacher with mirror polished finish. The kettle has a removable perforated lift-out drainer plate with handle. Special Offer. Free Fish-o-Meter. An accurate gauge that measures the exact cooking time of any fish of any size, using all cooking methods except microwave. The nifty tool removes all the guess work with no need to weigh the fish either. Worth £4.99.